What is a Zen Miniature Garden? Miniature gardens can be lush with greenery and teeming with life, but they can also be specially designed to promote peace, relaxation, and a minimalist sense of order. You may have encountered Zen gardens in your travels, or when reading about miniature gardens, and wondered to yourself, “What exactly is a Zen miniature garden? Is it even a garden at all?” If these thoughts have ever drifted through your mind, you are in luck, because we are here with a quick and easy guide to all things Zen on a small scale! Japanese rock gardens have existed in Japan since the 8th century. These traditional gardens incorporated sand or gravel to create “dry landscapes” with very few plants. They were used for meditation and sometimes located near palaces and temples connected with Zen Buddhism. Throughout the centuries, the designs and locations of these Zen gardens have evolved and taken on many forms, but they still feature the same basic components: dry landscaping materials, statues, rakes, and a limited number of plants. While we have come a long way since the very first Japanese Zen gardens, which were first created many hundreds of years ago, there is perhaps a no better time to create a Zen miniature garden of your very own! With all of the unique stresses, pressures, and anxieties present in our busy 21st-century lives, a Zen garden offers a space to rest, recharge, and refocus. Zen miniature gardening provides the same opportunities but on a smaller, more affordable, and more convenient scale. You can construct your very own small Zen garden for indoor or outdoor use. First, choose a shallow container. 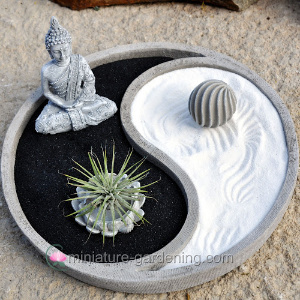 Cement plates work well, as their low borders keep sand inside the container and their neutral colors add to the peaceful, minimalist aesthetic of the miniature garden. These come in a wide variety of shapes, from squares and rectangles to lotus flowers and yin-yang shapes. Finally, you may want to add miniature accessories or miniature plants or miniature trees. Traditional Zen gardens include very few plants. 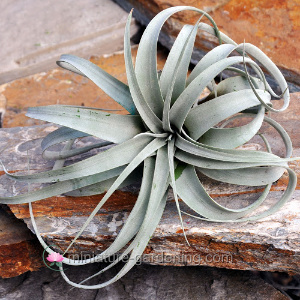 A bonsai tree is one suggestion, while another idea is to feature just one succulent or air plant. These require little water and can be grown within or on top of landscaping materials without the need for any soil. Faux plants need the least amount of maintenance (none!) and still, add a delicate touch of green life to the otherwise dry landscape. After adding plants, choose one or two miniature accessories to finish your Zen garden. There are many figures to choose from, including traditional Buddhas. If you enjoy adding human-like figures to the miniature garden, consider a regal fairy or a person who is reading, meditating, or standing alongside an animal. The figure you choose can reflect what you hope to “grow” in the garden, such as mindfulness - meditation, reflection, or wisdom. Other miniature accessories, like dragons, pagodas, and sensory balls, add texture and character to an otherwise sparse space. With a few of these in your arsenal, you can switch up the garden design whenever you feel a spark of creativity. Once you have completed your Zen miniature garden, it is up to you to decide where you want to show off your newest creation. Container gardens can be particularly pleasant additions to home offices or guest rooms, where they offer a small escape from the hustle and bustle. You might also choose to display it on a covered porch or as a dining room centerpiece. Remember—this is one garden that needs very little maintenance, especially if you choose to design it without any living plants. For this reason, Zen miniature gardens make particularly great gifts and can serve as a cheerful way to garden the day away when the weather outside is too hot, rainy, or otherwise undesirable for traditional gardening. The Zen style is indeed one of the most versatile, convenient, and unique in the gardening world. This blog post was published on 03/22/2019 08:27:10.